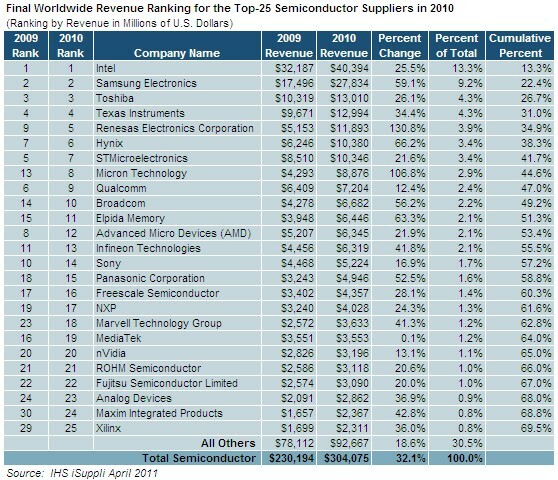 Intel’s position as the undisputed market leader in the semiconductor industry is being challenged by Samsung with recent reports (IHS iSupply) showing the two with only 4.1 percentage point difference in market share for 2010. Although both companies increased their sales significantly, Samsung was above the industry average growing by 59.1% vs a 32.1% growth overall for the entire semiconductor business. This strong performance by Samsung is driven mostly by booming sales of memory integrated circuits which is its main semiconductor product. Dynamic Random Access Memory (DRAM) was the biggest driver of growth for 2010 expanding by 75% while NAND flash memory also grew by 38.6% for the year. The unprecedented growth of Samsung started in 2001 when it only had 3.9% market share growing to 9.2% in 2010. This represents a 355% increase in revenue from 2001 to 2010 for Samsung. Intel’s performance meanwhile has ranged between 11.9% and 14.8% market share during the same period. A popular rival of Intel in the microprocessing unit (MPU) market, Advanced Micro Devices Inc. (AMD) also experienced a 21.9% growth on the same period but its ranking slipped from eighth to twelfth place. With AMD falling behind, the competition for overall semiconductor market share will be closely watched between Samsung and Intel. Projections for 2011 by market economists continue to preach caution about a possible double dip recession. Adding to the growing concern over economic instability are the continuing conflicts in the Middle East resulting to higher oil prices and the unemployment problems in most countries. These factors can affect the overall performance of the semiconductor industry for the whole of 2011 although most companies are optimistic that this year will be another strong year with the rise of smartphones, tablets and netbooks.